All Hoover High School Year 5 (10th Grade) students will participate in the Personal Project. The Personal Project is a significant body of work that is the product of a student’s own initiative and creativity. It is not an optional assignment; it is a required aspect of the IB Middle Years Program (IB MYP) around the world. The goal of the Personal Project is for each IB MYP student to develop a focus of deep personal interests that reflects the knowledge he/she gained through participation in the IB MYP. The Project should focus upon one of the six MYP Global Contexts. Students gain knowledge of these contexts in their courses, throughout their 6-10th grades. Remember, you will be working on this project for an extended period of time so it needs to be something you really want to do. 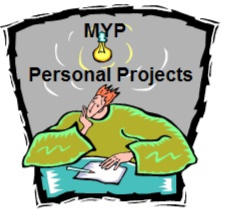 Use the links to the right to learn more about the IB MYP Personal Project at Hoover.